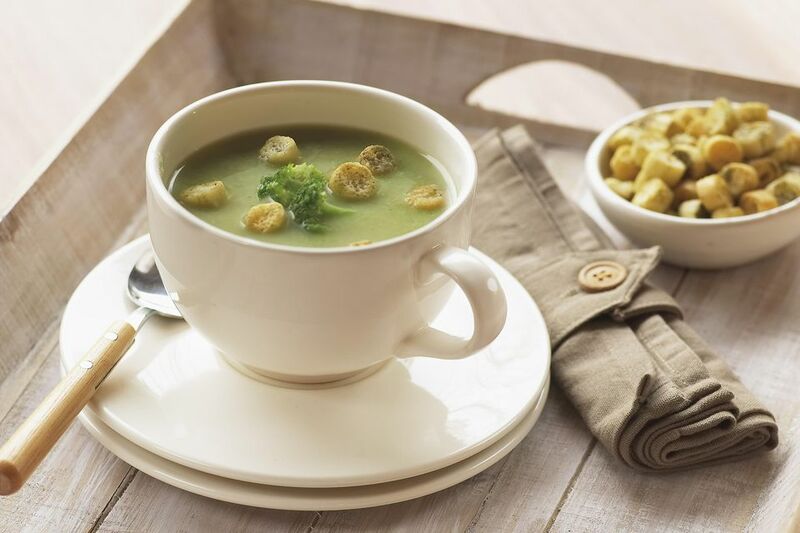 Cauliflower, Broccoli, Mustard Soup is a good all-rounder of the soup world. Made from two much-loved vegetables, makes it a favourite, and even better it is soup to eat year round. Of course, on a cold winters night, the soup poured hot into a dish with a heap of crusty bread on the side couldn't be more perfect. And, a warm summer's day, serve this soup chilled and sprinkled with some finely chopped summer herbs; the soup will make a lovely lunch. An old favourite, cauliflower, matches up beautifully with broccoli (or you can use Tenderstem) a little mustard and cheese to create a filling, nutritious soup which is sufficient to eat as a main course or a smaller portion for a starter. What's not to like? In a large saucepan or stock pot melt the butter, add the onion and cook slowly until translucent, stirring constantly. Add the garlic and cook for a further 2 minutes taking care not to burn. Stir in the mustard powder. Meanwhile, remove the leaves from the cauliflower and cut into florets and steam with the broccoli until almost tender. Add the onion, and cover with vegetable stock. Add the potato and bring to the boil, then simmer for 15 minutes or until the potato is cooked. Purée the soup in a food processor, return to the pan, adding the mustard and crème Fraiche. Bring back to the boil, reduce the heat and simmer for 5 minutes. Season to taste with sea salt and black pepper. To serve, place 50g/ 2 oz of grated cheese in the centre of a warmed soup bowl. Surround with the soup and top with croutons, or serve chilled with finely chopped fresh herbs sprinkled over. This soup freezes beautifully and so make a large batch, portion before freezing and it will keep well for about 2 months. Like chilled soups? Try these for more delicious chilled soups.